"I will get it built," vowed Trump, promising a "smart, strategic, see-through steel barrier." But he stopped short of declaring a national emergency to obtain funds to build the wall. "As we speak, large, organized caravans are on the march to the United States," Trump said, referring to the group of migrant men, women and children as a "tremendous onslaught." 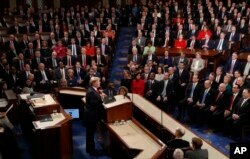 President Donald Trump delivers his State of the Union address to a joint session of Congress on Capitol Hill in Washington,Feb. 5, 2019. 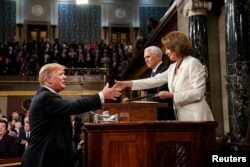 Trump made his second State of the Union address with a new backdrop: for the first time a Democratic Speaker of the House, Nancy Pelosi of California, looked over Trump's shoulder as he spoke in the House chamber of the U.S. Capitol. In an apparent acknowledgement of that new political reality, Trump focused much of his speech on calls for unity and bipartisanship. At one point, Trump insisted that lawmakers must "rekindle the bond of love" in Washington. "I ask the men and women of this Congress: Look at the opportunities before us! Our most thrilling achievements are still ahead. Our most exciting journeys still await." But it's unclear how receptive Democrats will be to such messages from a president who regularly hurls insults and denigrating nicknames at his political opponents on Twitter and who has often seemed more concerned about pleasing his own political base than reaching across the aisle. Democrats' reaction to the speech appeared mixed. Pelosi, along with other Democrats, sat with a polite smile, clapping only during selective portions of the speech. 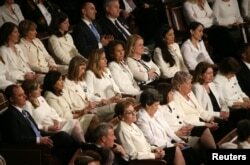 However, when Trump acknowledged that more women are serving in the current Congress than ever before, the entire chamber erupted in chants of "USA." But an awkward moment occurred early on, when Trump implicitly criticized Special Counsel Robert Mueller's Russia investigation. After citing a litany of economic successes, Trump said the only thing that could stop his "economic miracle" are "foolish wars, politics, or ridiculous partisan investigations." "If there is going to be peace and legislation, there cannot be war and investigation - it just doesn't work that way," Trump said -- a line that resulted in near-silence in the chamber. The investigation into Russia's attempts to interfere in the 2016 presidential election and any links between Moscow and the Trump campaign is reportedly nearing completion. Trump has routinely slammed the investigation and other similar probes in Congress as a "witch hunt." Trump's approval rating sank steadily during the shutdown, as opinion polls showed more Americans blamed him than Democrats for the impasse that resulted in 800,000 federal workers being furloughed or forced to work without pay. Trump's address did not indicate whether he was willing to shut down the government again over the wall debate. The president has repeatedly warned he may declare a national emergency if Congress doesn't give him $5.7 billion for a border wall by February 15, when government funding runs out again. The move is opposed by many lawmakers, including in Trump's Republican Party, most significantly Senate Majority Leader Mitch McConnell of Kentucky. Congress seems unlikely to give Trump what he wants, if the formal Democratic response to the president's speech is any indication. 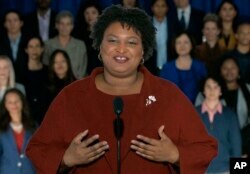 In this pool image from video, Stacey Abrams delivers the Democratic party's response to President Donald Trump's State of the Union address, Feb. 5, 2019 from Atlanta. In her rebuttal speech, Stacey Abrams, a former Georgia state lawmaker who is seen as a rising star in the Democratic Party, slammed the shutdown as "a stunt engineered by the president of the United States, one that defied every tenet of fairness and abandoned not just our people, but our values." "We are considered far and away the hottest economy anywhere in the world -- not even close," Trump said. The national debt has ballooned to nearly $22 trillion and recently accelerated thanks in large part to Trump's 2017 tax cuts which largely benefitted corporations and wealthy Americans. The stock market, meanwhile, is down over 3 percent since Trump's last State of the Union address, due to uncertainty about Trump's trade policy. To build on U.S. economic success, Trump will say that "one priority is paramount: reversing decades of calamitous trade policies." "It is unacceptable that Americans pay vastly more than people in other countries for the exact same drugs, often made in the exact same place. This is wrong, unfair, and together we can stop it," Trump said. Foreign policy, including Trump's talks with North Korean leader Kim Jong Un, was a heavy focus of the speech. Trump announced a venue and date for his upcoming second summit with Kim -- Feb. 27 and 28 in Vietnam. "Much work remains to be done, but my relationship with Kim Jong Un is a good one," Trump said. "As a candidate for President, I pledged a new approach. Great nations do not fight endless wars," Trump said -- comments that could upset many in Congress. The Republican-led Senate earlier in the day broke with Trump on Syria and Afghanistan, passing a largely symbolic resolution that opposed a "precipitous withdrawal," insisting militants in both countries still pose a threat to the U.S.
Trump also reiterated U.S. support for Venezuela's interim president, Juan Guaido, the head of the opposition-led National Assembly who declared himself interim president last month. "We stand with the Venezuelan people in their noble quest for freedom," Trump said. The Trump administration last month recognized Guaido over current president and longtime U.S. foe Nicolas Maduro. Many other governments have since followed the U.S. lead in recognizing Guaido, saying Maduro should step down because he ruined Venezuela's economy and came to power in flawed elections. In keeping with tradition, the White House invited several guests who reflect the president's policy priorities. Trump's guest include the family of a couple who were killed by immigrants in the U.S. illegally, a woman who struggled with opioid abuse, and a child named "Joshua Trump" who the White House says was "bullied in school due to his last name." That group of women remained seated when Trump proposed legislation to prohibit the "late-term abortion of children who can feel pain in the mother's womb."